Switzerland has amazing landscapes and the country itself holds amazing secrets and natural beauty. In order to visit the country, the tourism infrastructures are highly qualitative and easy to be organized. But sometimes we realize that the location is perfect but the hotel not so much. And it is the case of the Seehotel Waldstaetterhof in Brunnen. Here below the narration of our chief editor in this supposed 4 star hotel. Could be a novel but it is true. 1291 is probably the most important date for Switzerland. It sets the foundation of this amazing country. History tells that in the beautiful meadow of Rütli by the Lucern lake, 3 Swiss valley communities built the first idea of Switzerland. The 3 rural communities were Uri, Schwyz, and Unterwalden. The idea was to get a first agreement that would manage common interests as well as the peace in the region. This first gathering is also called the Old Swiss Confederacy. Since then, the Lucern lake is one of the most visited area in Switzerland. Not only by foreigners but also by Swiss people who come to the foundation place. The area is magnificent and you cannot visit Switzerland for the first time and not come to this area. 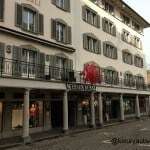 Brunnen, the city facing the Swiss historical meadow, has a perfect place to welcome all tourists. 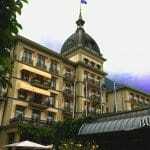 Several hotels are available and at Luxuryactivist, we tried the well-know The Seehotel Waldstaetterhof Brunnen. And during 2 days the deception is quite big. The Seehotel Waldstaetterhof, does not deserves the 4th star. Being around quite often, I usually stay in Schwyz, in the beautiful Wysses Rössli hotel. Unfortunately this week, the hotel was full booked and for the first time I spent 2 days at the The Seehotel Waldstaetterhof in Brunnen. At the beginning I was quite excited because from the outside the hotel seems a beautiful place to be. But very fast, we can really loose the dream of a beautiful experience. The illusion vanishes after the first minutes at the main reception desk. The hotel administration does not place enough people at the reception desk. And the employees are very young without so much experience. After a trip of several hours to arrive in Brunnen, we expect from this amazing hotel to feel welcome. I would expect to be welcomed by the receptionist with a friendly “welcome” and basically NO. The receptionist checked my name in their system, found it and printed the little contact form. She tells me to sign the form. I realize that my email address is completely wrong, a hotmail address that I never saw before. I informed the receptionist that the email was wrong and she tells me to “just sign it and it is ok”. Then she gave me the internet connection and of course a satisfaction questionnaire. She just showed me in which direction was the lift and that was it. The rooms are fine but definitely 30% too expensive for a regular 4 stars. You can feel that you pay for the location. When discovering the modern bathroom, we could see traces of the blue cleaning product in the shower, so we could see that they are also try to save on the bedroom personal as everything seems to be cleaned quite quick. In the next morning, I took the lift to reach the ground floor. There I came accross more than 100 people. They all arrived by boat from the Lucern lake. So around 50 women of a certain age were queuing for the toilets. You can imagine that so many people passing by the toilets in such short notice, a terrible smell was flying around in the corridor, up to the breakfast room. In the breakfast room, it was the same story. Only one person to clean the tables, so when I got to the breakfast room, all tables were dirty. Only a stressed lady was running around trying to do her best. The first time she came accross me, I said good morning. She did not answer. Probably not enough time. So I finished by pushing dirty dishes of one of the tables and sit as best as I could. Another lady came to ask if I wanted a warm drink. After having my black coffee, I realized that the breakfast buffet was not that great. Everything quite dry and not tasty. After breakfast, I got to my car in the park place. I was blocked because there was a tourist bus blocking the exit. After buzzing the car horn several times, the bus driver came and moved away. So I could finally go to work. In the evening, back to the hotel. I was saying to myself that probably it was just a bad day for the hotel. By arriving at the reception desk, I could already smell a very strong scent of cigar and tobacco. While walking the ground floor corridor to take the lift, the fumoir was definitely not well protected and a very strong cigar smell was all over the place. We could almost vomit as the scent was so strong. When I got to my room, the first seconds after switching the lights I thought that the cleaning was not done. In the bathroom, the floor carpet was badly positioned, basically as I let it in the morning. On the office-table the bottle opener was let in the middle of the table as forgotten by me in the morning and the paper seal of the mini-bar (that I opened on the previous evening) was still there rather than in the trash bin (or elsewhere). So we could see that the cleaning was done fast, very fast. Being tired, I called for room service. Wrong move. When the lady arrived with my meal, she brought with her the bad smell of cigars. My entire room was filled with this disgusting smell of cold tobacco. I was obliged to open the window of my room for at least 30 minutes as it was almost impossible to eat something. To summarize, do not come to the Seehotel Waldstaetterhof in Brunnen. Or just for a lunch. You will dream about an ancient time of Grand hotels and elegant people. Unfortunately this hotel lost its prestige because they expect that people will come for the location and they do not care about the service. So the location is a 4 to 5 stars location but the hotel, merely a 2 to 3 stars in an ancient building. It is a pity because the place could revive the spirit of a Grand Hotel but they lack probably of ambition. If you check tripadvisor, you will see that almost 2o% of the reviews about the hotel is from average to poor and terrible. It is definitely the last time I stay in this hotel. Info sourced at the luxuryActivist chief editor experience. All content is copyrighted with no reproduction rights available. Images sourced in the hotel website, itaste.com, wikipedia here and here.